The Griffith Mates team helped us reach an important milestone last week. The final stage of a five year project was reached as the last patch of Fishbone Fern Nephrolepis cordifolia has been cleared at our Fox Gully Bushcare site Zone 13. 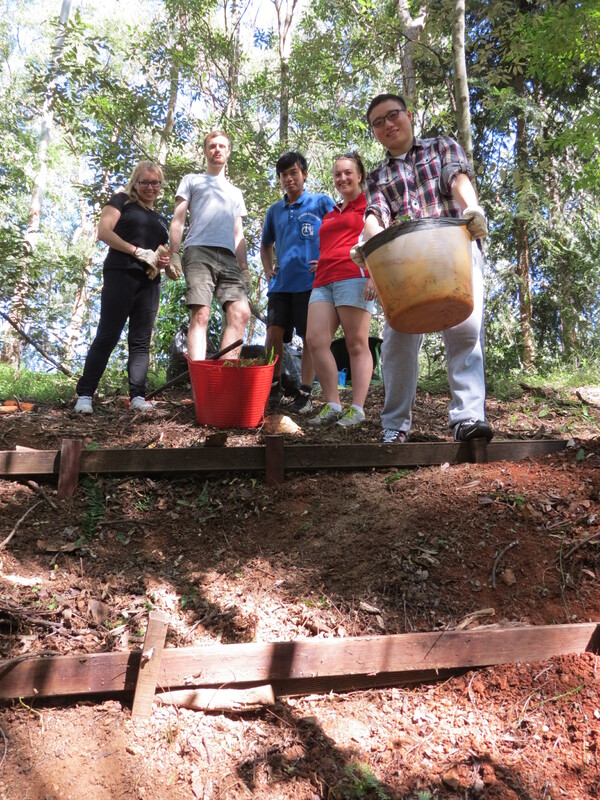 A team from FWR Group started the daunting task of clearing the Fishbone jungle from the gully. In urban areas where Fishbone Fern has been cultivated as a garden plant it has escaped into remaining patches of bushland crowding out indigenous species. Six species of native fern are indigenous to the Fox Gully habitat. Removal of the weed is allowing natural regeneration of indigenous grasses, ferns and vines. 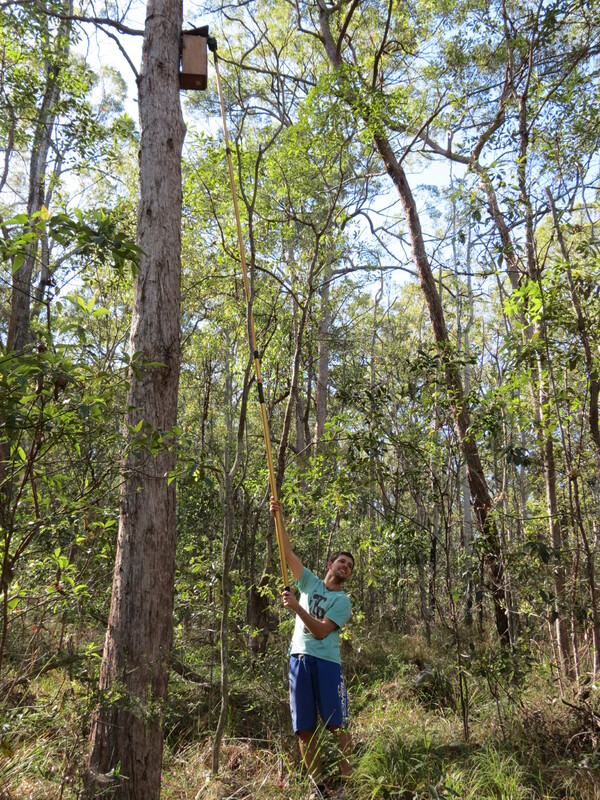 Removing Fishbone Fern is a time consuming job so the support of a team from Conservation Volunteers Australia (CVA) was a major boost for the project. It is a particular pleasure to welcome Griffith Mates back as they always have a great interest in our local wildlife. 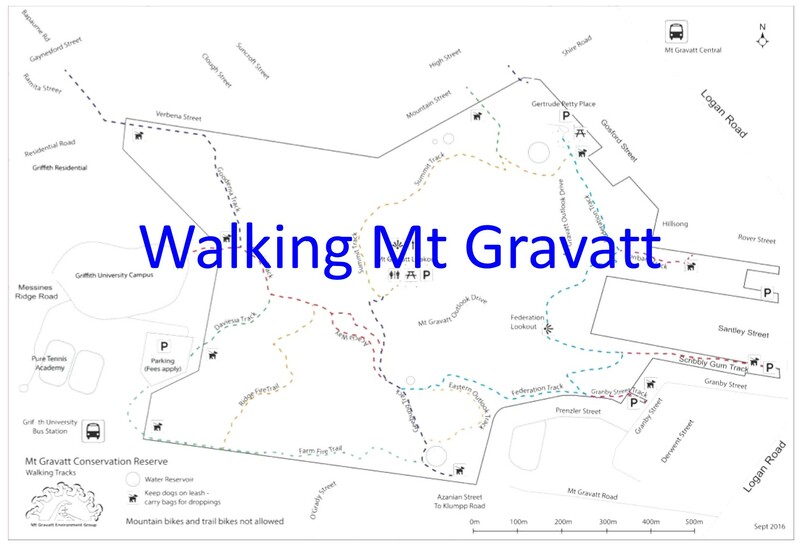 They even insisted on walking through the forest from Mt Gravatt Campus. 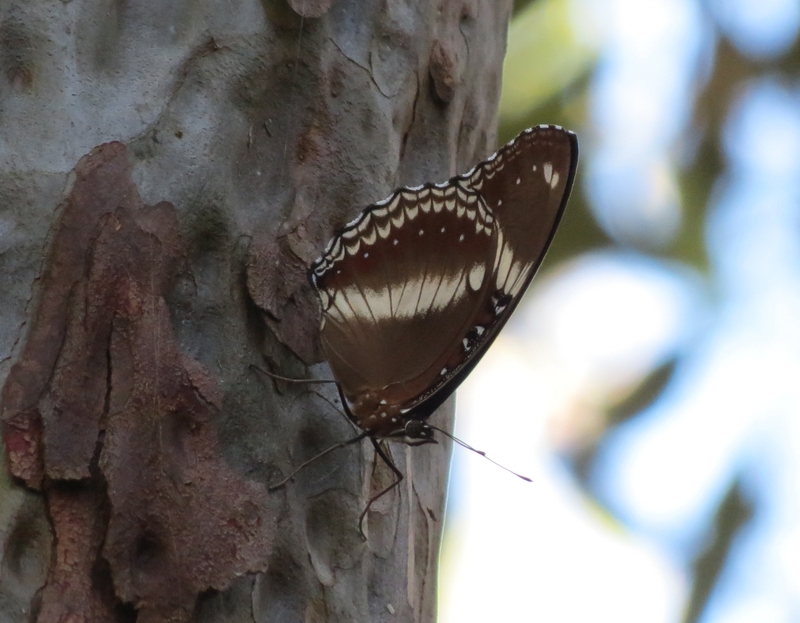 So it was good to be able to show this perfect specimen of Common Aeroplane Phaedyma shepherdi butterfly posing on a Spotted Gum Corymbia citriodora. We finished the morning by checking the nest-boxes introducing our visitors to some of our cutest wildlife. And Australia’s smallest flower on Native Cherry Exocarpos cupressiformis. 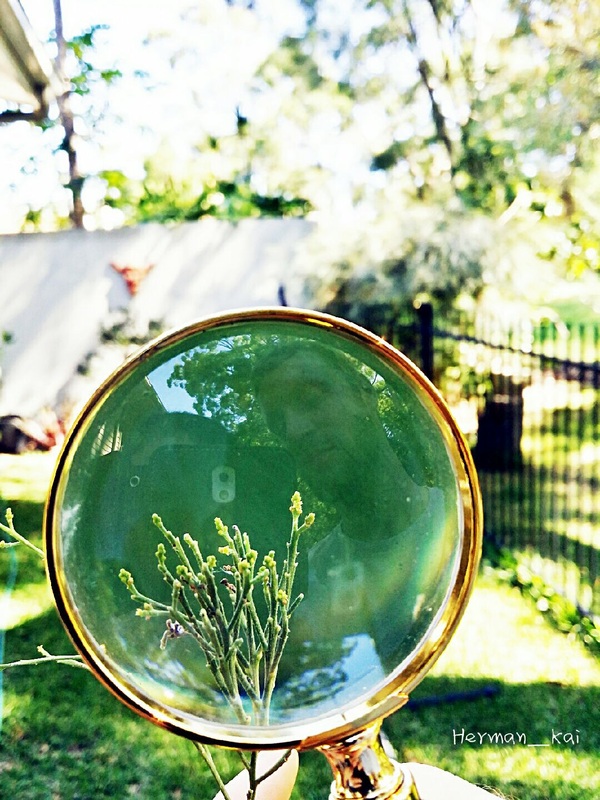 Looking for flowering bushfood trees is difficult when you need to carry a magnifying glass. 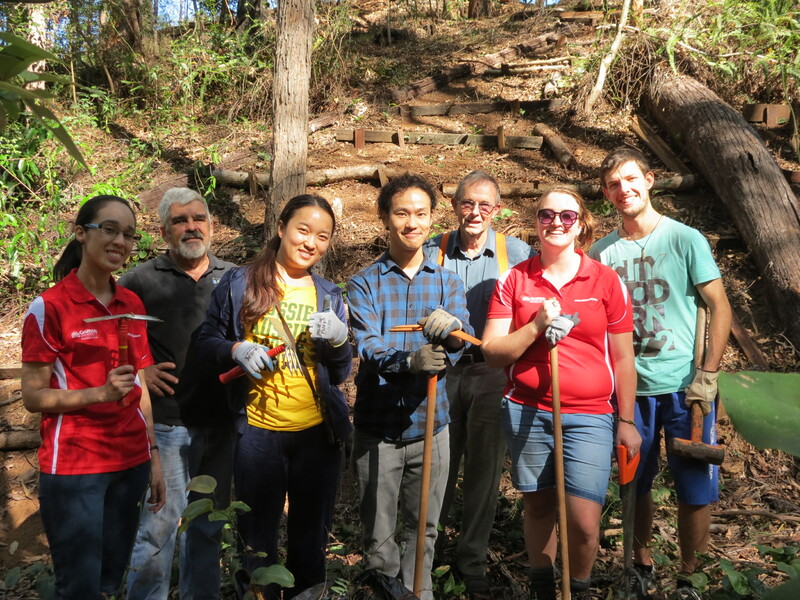 A beautiful autumn Saturday morning and Griffith Mates – Sienna, Ben, Lily, Abraham and Larissa joined Roger and myself at Fox Gully Bushcare site. 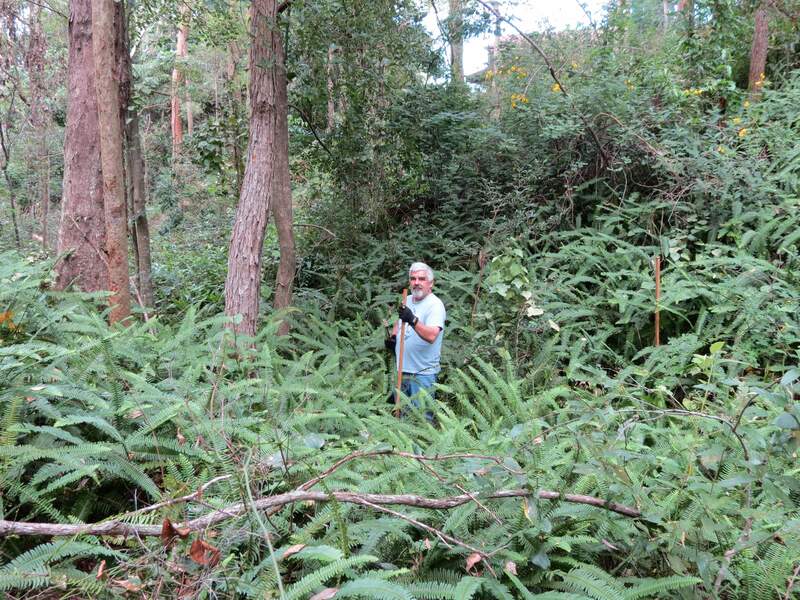 The team removed another large area of Fishbone/Sword Fern Nephrolepis cordifolia and installed logs on the slope to create a safe work space and control erosion. 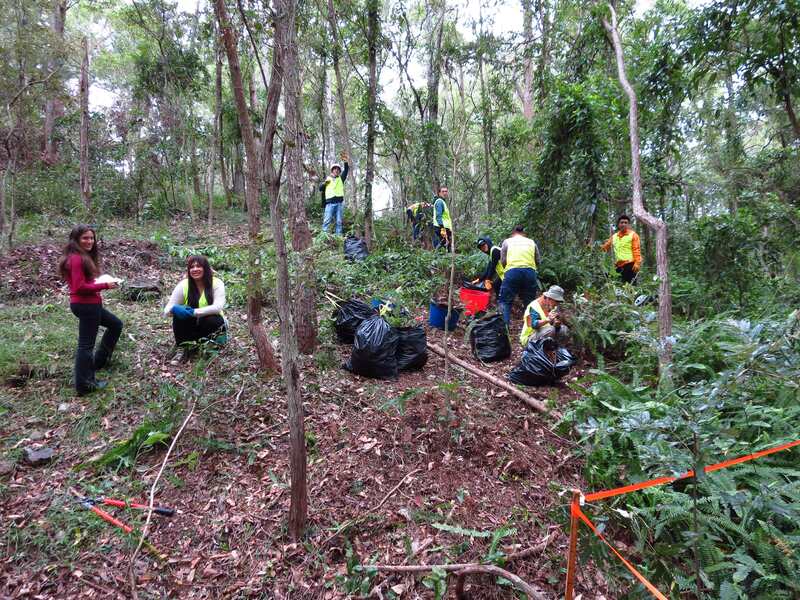 When the team from FWR Group joined our Wednesday Bushcare in September 2010 to start clearing, the Fishbone Fern covered an area larger than the average Brisbane house block – approximately 1,000 square metres. By the time the FWR team returned six months later, in March 2011, natural regeneration had already restored a good coverage of native grasses like Ottochloa gracillima Graceful Grass. This Living Mulch of native grasses controlled erosion, suppressed weed regrowth, retained moisture and provided food for caterpillars of the Brown and Orange-streaked Ringlet butterflies. By the time the Griffith Mates team finished another huge area had been cleared and stabilised with logs. Restoration work on the Fishbone infested areas of Zone 8 is now almost complete and with further help from Griffith Mates we expect to finish the weed clearing this year allowing nature to take over with the natural regeneration of local grasses, herbs, ferns and vines. To finish the morning I showed the team how we check nest boxes installed to provide substitute nest hollows for birds and gliders. 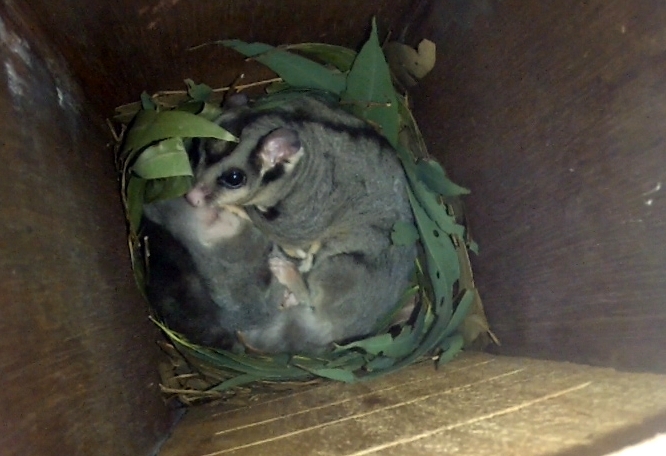 We found the Squirrel Glider family in two boxes and the female Brushtail Possum is still living in the Kookaburra box. She was quite curious about the camera, reaching up to sniff the lens. It is a particular pleasure to share this wildlife experience with young people from places like Hong Kong.